Inspired by the unique beauty of abstract design, the Chocolate Art collection is sure to make the recipient feel special. 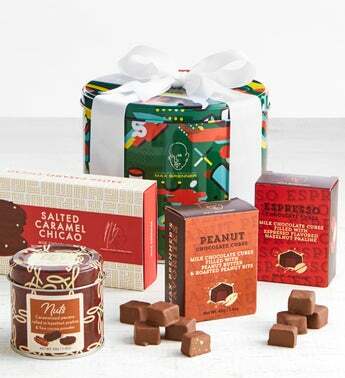 This gift set is filled with Max Brenner’s famous Caramelized Pecan Nuts with hazelnut praline & fine cocoa, Peanut Butter Chocolate Cubes, Espresso Chocolate Cubes, and Salted Caramel Chicao. The sleek white bow completes the stunning presentation of this gift. The uniquely designed re-usable tin is a gift that keeps on giving, long after the chocolate is devoured. Inspired by the unique beauty of abstract design, the Chocolate Art collection is sure to make the recipient feel special. This gift set is filled with Max Brenner’s famous Caramelized Pecan Nuts with hazelnut praline & fine cocoa, Peanut Butter Chocolate Cubes, Espresso Chocolate Cubes, and Salted Caramel Chicao. The sleek white bow completes the stunning presentation of this gift.